C-COM Ka-band antennas authorised for operation on Gen5 platform. Ottawa, March 2018: C-COM Satellite Systems Inc., the leading global provider of mobile auto-deploying satellite antenna systems, has announced that its iNetVu® vehicle mount Ka-band antenna system, model Ka-98H/JUP, has received type approval from Hughes Network Systems (HUGHES), for operation on its HughesNet™ Gen5 platform powered by Hughes JUPITER™ System Technology. Hughes is the global leader in broadband satellite solutions and services and is a wholly owned subsidiary of EchoStar Corporation. The new antenna operates in Ka-band but is field upgradable to Ku-band, making it ideal for Broadcasters, Oil and Gas Exploration companies, Telemedicine, First Responders, as well as governments and military. “The 98H/JUP series antennas are supplied with C-COM’s proprietary iNetVu® controllers which have been field tested for over a decade and are in use with more than 8,000 units in the field" said Leslie Klein, President and CEO of C-COM Satellite Systems Inc. "This cost-effective driveaway system offers an attractive solution to customers interested in taking advantage of the availability of higher speed and lower cost Ka-band service offerings,” Klein continued. 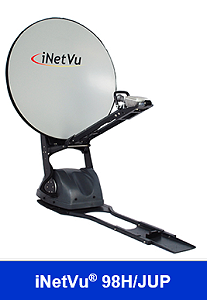 The iNetVu® 98H/JUP antenna systems are available for immediate delivery.